THE ONE WHERE Alex finally discovers the truth about Gene Hunt and why she is back in the ‘80s. VERDICT So, the Ashes universe is at last explained: it is purgatory, the place where the dead pass through before going on to what is presumably Heaven. Chris was shot dead, Shaz was stabbed, Ray hung himself and, well, we know how Alex died. Gene is an angel who helps them pass successfully to the other side by helping them achieve redemption, while Keats is a devil who wants to entice them into Hell. That’s my interpretation of it anyway. And written down like that, I must admit it doesn’t sound very good. But it is a good finale, although it is quite a depressing and unsettling one. Those full-of-life, wonderful characters were just walking corpses all along. Alex will never see her daughter again (although in the “after life” she presumably will), Alex and Gene will never get together and Sam Tyler is gone forever too. Sadly no John Simm cameo here. By the end you realise why this third series had been so much glummer than its predecessors – it had to be, because an upbeat seven episodes followed by this downbeat eighth one would have been weird. Even the It’s A Knockout section at the start of the ep, which would have been very funny placed at other points in the Mars/Ashes run, is here tinged with doom. As someone who’s seen every single Mars/Ashes instalment I spent a lot of this one with a furrowed brow, a little confused and mildly disgruntled about what was going on (my notes include the scrawled exclamation made half way through, “They’re all DEAD...?”). I can only imagine what others who haven’t seen much of it would think. As Keeley Hawes said in SFX a few months ago, it’s bonkers and a lot of people are not going to “get” the conclusion, and I’d add that a lot of people won’t like it either. But then wrapping up this series was always going to be difficult, because there were so many elements in it, and so many red herrings (we now know, for instance, that the guy who said he was Sam Tyler, wasn’t). Overall I reckon this wasn’t as good a final episode as the final episode of Life On Mars, but then it wasn’t as good a series as Life On Mars. It was enormously watchable but not as consistent, and the high points weren’t as high. Some might complain that it was stretched out to three series, where two might have been better, but I’d counter that it was wise to give as much exposure as possible to the greatest TV character created in the last ten years: the mighty Gene Hunt. DID YOU SPOT? When Keats is driving he says he could listen to “Club Tropicana” forever - a nod to his idea of Hell, but also maybe a clue that this metaphysical realm is in some way linked to '70s/'80s pop music in a way that we don't understand! NITPICK Chris talks about “health and safety” and although it was a 1974 Act of Parliament that first married these two words to each other, you could argue that the phrase didn’t properly enter the public consciousness until the ‘90s. STAR TURN A great performance in particular from Dean Andrews when he discovers the truth of his death. 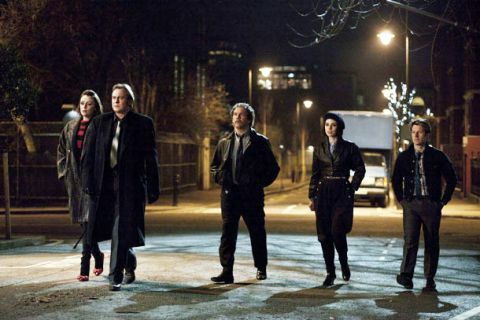 TRIVIA And the last ever line of Ashes To Ashes is Gene’s “A word in your shell-like, pal,” to the latest cop from the future to enter his office.